As January 1st, 2000 approaches, more phone calls asking about alternate energy sources are coming into the Hotline. Generator sizing is the number one issue and we will discuss proper sizing in the next edition. However, in this issue we would like to answer questions regarding alternative power sources. Battery Back-up: The popularity of battery back-up systems is increasing due to the concern for Y2K and because more people are moving to remote areas. Battery back-up systems are used to provide power where utility power is unavailable or to provide uninterrupted power during outages. Battery back-up systems are typically used in conjunction with generators, photovoltaic cells, windmills and utility power sources. These sources provide DC power to a battery bank while they operate. When the power goes off, the batteries switch on. However, since our homes normally operate on AC power, the first step is an inverter. The Inverter: The inverter changes the DC (Direct Current) power from the battery into AC (Alternating Current) power. The inverter also changes or boosts the typical 12 volt power from the battery to 120/230 volt AC power which is normally required for our homes. The inverted/boosted power can then be used to operate a submersible pumping system. 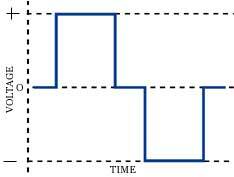 Sine Waves: There are typically two types of inverters used to convert this power. One type is commonly known as a “pure wave” or “sine wave” inverter. The other is known as a “modified wave” inverter. The name comes from the type of power wave created or supplied to the output side of the inverter. Pure Wave: The figure to the left shows a typical “utility” supplied sine wave. This is the wave that comes into your house and is used to operate your electrical appliances. This sine wave is typically smooth and looks sort of like a roller coaster ride. Pure wave inverters duplicate the smooth flowing sine wave and can be used with today’s electronics. This includes televisions, VCRs, computers, etc. 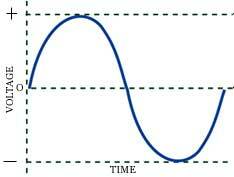 This type of sine wave can also be used to power Franklin Electric’s submersible motors and control boxes. Modified Wave: The figure to the left shows the output from a “modified” wave inverter. This looks similar to a pure sine wave except there are typically on/off steps. This modified wave generally does not work well with electronics and can be a problem for Franklin’s 2-wire and small Hp 3-wire motors. Concerns: Franklin’s 2-wire motor utilizes an electronic “Triac actuated, Bi-metallic” switch, know as a BIAC switch. Franklin’s 1 Hp and smaller 3-wire motors also use an electronic “Triac actuated” switch known as the QD (blue) Relay. Triacs are electronic switches used to turn off the start winding of the motor. Because a modified sine wave “steps” instead of “flows”, there may be incidents were this style of switch may not work reliably. It is best to only use a pure wave inverter for 2-wire motors. For 3-wire motors a simple modification to the control box makes it compatible with a modified wave inverter. 3-Wire Solution: Substituting a “voltage” relay into the 3-wire control box allows the system to work with the irregular sine wave shape. 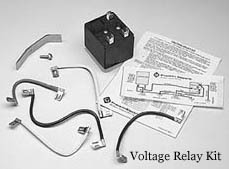 Franklin’s voltage relay kits supply the voltage relay, mounting hardware, jumper wires and instructions required to make this change. Franklin part 305 102 901 is the 115 volt kit and 305 102 902 is the 230 volt kit. Franklin 3-wire systems larger than 1 Hp already contain the voltage relay and will work with either type of wave. This entry was posted in Archives and tagged Alternative Power Sources by copywriterfele. Bookmark the permalink.